According to the Michigan Asparagus Advisory Board, asparagus harvest runs for a 6-7 week period between late April and mid June. Annual variation in weather will shift asparagus harvest a bit, and a few recent overcast and chilly days have delayed the first asparagus meals. On a nice sunny day, asparagus will shoot upward inches at a time. If you’re growing the green stalks, keep a close eye on them. CSA (consumer supported agriculture) farms and farmers markets will only have salad greens and spinach early in the season. The arrival of asparagus is a glimpse of great things to come. But, as quickly as asparagus punches in, it departs. Though harvest in Michigan should last through the entire month of May, it’s more like a 3-week window. 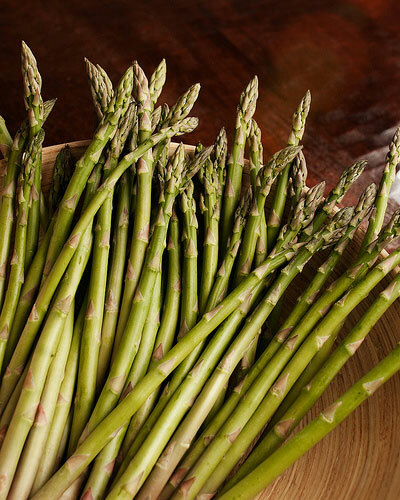 As the days get warmer, asparagus will feel decreasingly fresh. Michigan takes asparagus seriously. We’re the third largest producer in the United States, behind California and Washington. We even made a movie. About asparagus. Here’s the trailer. My favorite preparation of asparagus is roasting it. Sprinkle olive oil over the asparagus. Alternatively, you can shake the asparagus and olive oil together in a sealed plastic bag. Roast for about 10 minutes, or until asparagus is browned and/or tender.